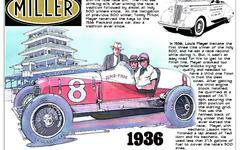 This article appeared in the 2005 Indianapolis Motor Speedway Allstate 400 program. It recounts the brave drive of 17-year-old Charlie Merz and co-driver "Jap" Clemens. In an event organized by future Indianapolis Motor Speedway founders Carl Fisher and Art Newby, the teammates toughed out the frigid Indiana November weather throughout the night of 24 hour speed record attempt. This is the story of how these met set the new 24 hour speed record - and the behind-the-scenes effort required to set the stage.